This is my second recipe for the Taste of Home Cooking Blogger's Choice Recipe Swap. The blog I was given, Oishii, had so many good recipes that I couldn't choose just one for the swap. I made Yakitori (see above post), and this Vegetable Lo Mein to go with it. The original recipe used leftover salmon in the lo mein, but I kept it vegetarian. I have made lo mein a few different ways, and really enjoyed this recipe. I think this may be my new go-to sauce recipe for lo mein! We love spicy foods so using Sriracha in the sauce made us both very happy. I usually use thin spaghetti when I make lo mein, but followed the author's recommendation to use Nasoya Chinese Noodles. These noodles are more than double the price of spaghetti, but they definitely work better and taste more authentic in this dish. When you buy the package of noodles (found in the produce section in my store), it looks like you won't have enough, but once you cook them you will have enough for 3 to 4 nice sized servings which meant leftovers for lunch! 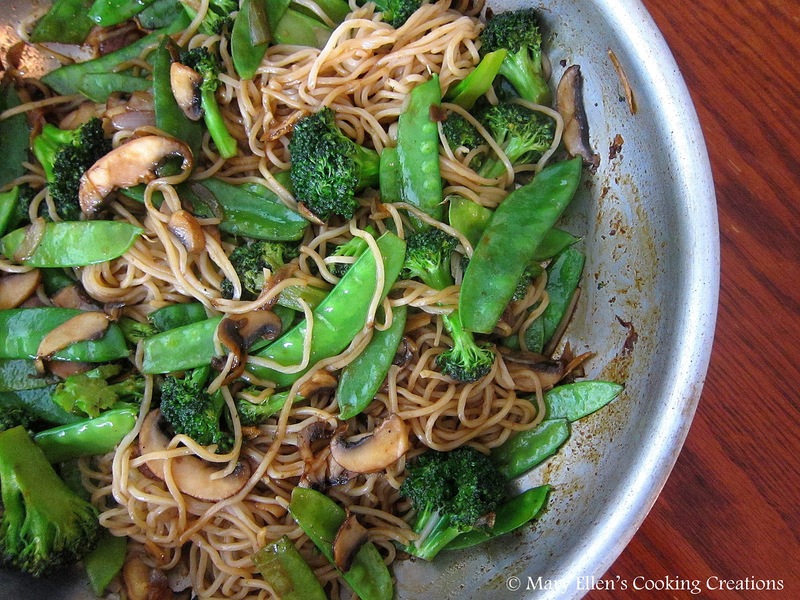 I also usually add more veggies to my lo mein, such as baby corn, carrots, water chestnuts, and bean sprouts, but this time I stuck to the original recipe only using broccoli, snow peas and mushrooms. Although Jon LOVED this dish, he said he would've liked more veggies. I think adding sprouts would work very well without taking away from the original recipe. Here is the recipe I followed (minus the salmon; see original recipe above if you'd like to use salmon). Cook the noodles according to package directions (3 minutes), drain, rinse with cold water, drain again. Set aside. Heat oil in a wok until very hot. Add the onion and garlic and stir fry for 1 minute. Add the broccoli and put a lid down over the veggies for about 3 minutes to speed up the cooking. Remove the lid and add the mushrooms and snow peas; stir fry to about 2 minutes. Add soy sauce, rice wine vinegar, chili sauce, mirin, brown sugar (I mixed everything in a bowl first), and salt & pepper to taste. Tilt the wok so the sauce runs to one side; cook sauce this way over the heat for a minute or so until it begins to thicken a little (great tip!! ), then combine with the veggies again. Add the noodles to the wok and drizzle a little oil over them (about 1 tsp). Stir fry for a few minutes combining them with the veggies and sauce. As the author also mentioned, tongs worked great for this. okmsesHello Mary Ellen: Just came across your blog while researching recipes for grilled cauliflower. I was mesmerized and drooly digging deeper and deeper into your wonderful collection of recipe experiments and adventures. Jon is a good partner. Your enthusiasm for good, healthy food and your quest to constantly expand your culinary horizons is both delightful and encouraging. I love a cheery, chatty blog. And that's what you've served up. SWEET! June - thank you so much!!! I really enjoy cooking and sharing my discoveries and recipes. So glad you enjoy my blog!! !